[*] Some parts of missions will take place in the countryside outside of the 3 cities. [*] The game story will be tripled in length. [*] If you get too fat, those that give you missions have the ability to tell you to get in better shape before starting a certain mission. [*] The HUD (heads up display) will be similar to GTA III's and Vice City's. [*] Orange Grove is the name of one of the towns/suburbs that's where the Orange Grove Families come from. [*] There will be less pop-up of distant objects. Houses can be seen from far away. [*] Groups of trees will be rendered as a group from distance. If you get closer, they'll be rendered seperately. Because of this, a bigger draw distance is possible. [*] The magazine claims that the animations will be even better than in Vice City. [*] The goal of the programmers is to achieve a constant frame rate of 30 frames per second. But, in extreme situations when there are lots of cars and pedestrians on the screen, the magazine says that the game still has some slowdown issues. [*] The textures will be photographed ones as well as self-drawn ones. [*] The camera will automatically zoom behind CJ at the press of a button. Then you can aim freely with the analog stick. But as an alternative to that, there will also be the aiming-aid. [*] The number of licensed music tracks in SA will have tripled. [*] The game is now about 80% finished (probably a month ago). [*] Even the dual-layer DVD is actually too small for the game. Due to new compression techniques for the PlayStation 2, the game barely fits on it. IGN have posted an article summing up most of the stuff we know about San Andreas in a Q&A style. Updated Info page and teaser site today? I have updated the San Andreas Information page and it now has all the info that we were told by articles in recent magazines. Also if you remember we posted about how Rockstar have launched a teaser site on the 1st of July for each GTA game, will we see one today? so far nothing has been said. I added these earlier this week but forgot to post about them, anyway the German version of OPSM2 has some screens which most of them we have seen before. There is one new one and also a fake map of the game. How do we know it's fake? Well Rockstar said that Los Santos is a small part in the lower right of the map, in the screen in OPSM2 De it is right in the center and is the same size as the other islands. Don Salvatore not in SA? Could this mean he is not going to appear in San Andreas? or could it just be Rockstar wanting to keep it a secret? Well fortunately there was hardly any downtime when we moved servers and nothing was lost. During the little downtime there was, I bought some more bandwidth and it is now double what we had before. This was desperately needed as we were almost using up our limit every month, mainly because of the download database. I bought this using money I had made off the advertisements so I would like to thank everyone who clicked on them. It is actually mainly the Amazon (main site), Google and AdHearus (forums) ads that are making money so I may think about removing some other ads and concentrate on using those three. Currently we have Amazon ads displayed on the main site and these get money if you buy something after clicking them and Google and Adhearus ads on the forums which make money for each unique click so i may replace the other ads (Alienware etc.) on the main site with these. You will notice I have repositioned the ads and I think it looks better and people have also said they like it better, so just click once a day and you can do your bit to help the site. There is going to be some downtime in the next day or so, I have been told by my host that "your site is growing very popular and is making the server slow" so they are moving the site to another server which isn't any slower and if anything should be faster, what it does mean is that I have to change the nameservers which takes anthing from 12-72 hours, hopefully not that long though. Also if any stuff is lost it will mean I have to re-upload everything which will take a while but that shouldn't happen either. - On the game map Los Santos is only a tiny bit in the lower right corner. - You can wear a lot of new clothes. - Dual wield multiple gun types. - Vehicles get rusty and dirty as time goes by. - Carl's customizations include: Hairstyle, Physique, Weight, Driveing Skills, Clothes, Possessions, Weapon Skills, Chracter, Relationships, Gang. - The art team has snuck in plenty of special pictures and messages for fans. - For the first time in a series the game will adjust its diffculty if the player becomes stuck. Rockstar assures that that the adjustments will be minimal and almost invisible to the players, so the missions won't become a breeze. 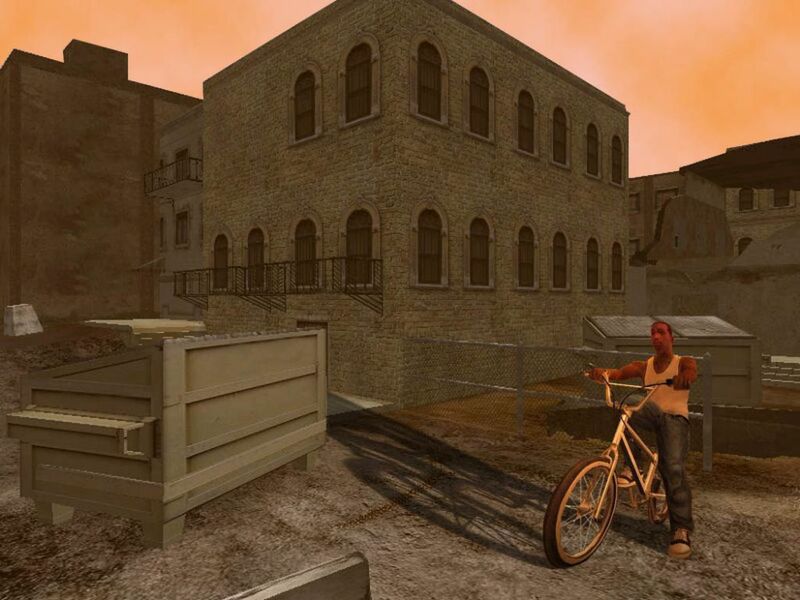 - San Andreas has its own version of Hollywood called Vinewood. - When the OGF fell from power, the new rival gangs The Flats and The Ballas moved in. - Brian Johnson is CJ's 10 year old brother that died in an accident and the reason he went to Liberty City prison for five years. - The Johnson family is in disarray as Carl and Kendl can't get along with Sweet. - Frank Tenpenny and Eddie Polaski know CJ from when he was in juvenile hall, and now they harass him in SA. - Cesar, a new Latino character wearing baggy slacks, an undershirt, tattoos, and a buzzcut has been confirmed. - Old Reece is CJ's old barber that still gives him haircuts anytime he comes in. "Menace" is a mission name (from "Menace II Society). "Reece's Hair Facial Studio" is one of the barbershops. The barber's name is "Old Reece." 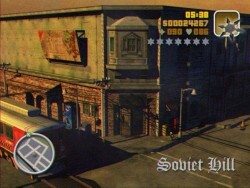 St. Brutus Motel is one of the buildings in Los Santos. Dan Houser said, "It's the third part in a loosely held together trilogy that started in 2001, that went to the mid '80s and has now come to the early '90s.". Real-time reflections on some floors, puddles, etc. Teaser Site on July 1st? zeppelincheetah at PlanetGrandTheftAuto.com points out a pattern of teaser sites launching on the first of July. 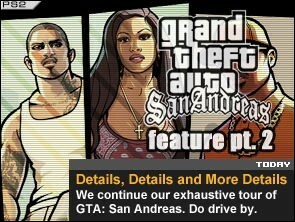 July 1st, 2001 - The Liberty Tree - Rockstar's initial teaser site for GTA III. July 1st, 2002 - Kent Paul's Nostalgia Zone - Rockstar's teaser site for Vice City. July 1st, 2004 - ??? 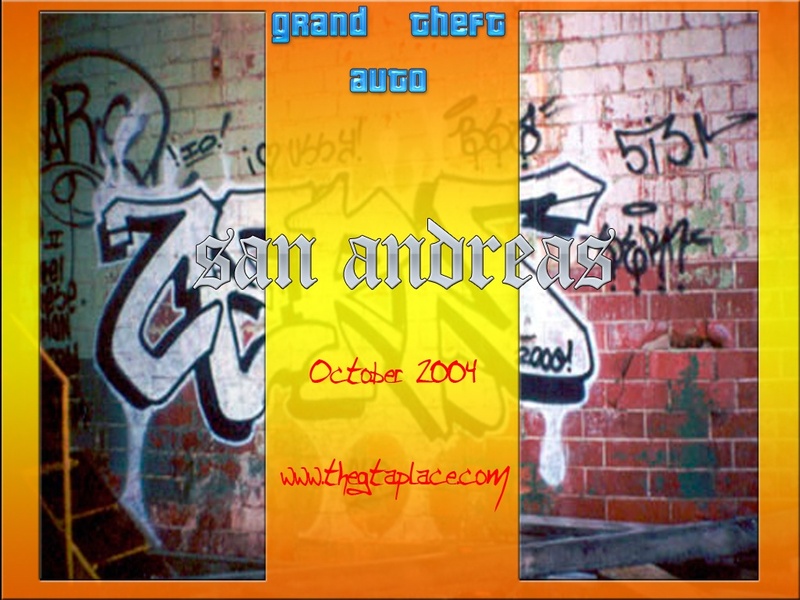 - Rockstar's teaser site for San Andreas. Let's hope something happens on July 1st. You can see more scans on the <a href="http://www.thegtaplace.com/index.php?page=sascans">Magazine Scans</a> page. Screen 1 = "Wait a sec. OMG, I kicked my accelator off my bike.. "
Screen 2 = "Ok gentlemen. Your trunk is clean, you can goooooooooooooo!" Screen 3 = "That's old, a pick-up like this. We got CD's for ages." "We have a lot of script writers working on GTA, and they use so many scenarios to build the story - it's impossible to do that in an online game, that problem has not been solved,"
Captain Cody has made a cool fanart which looks pretty realistic, I've added it to the fan art page with the others. No other related news to post at the moment unfortunately. 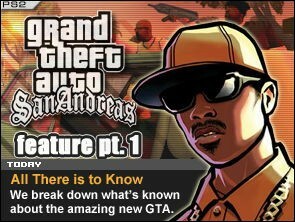 Gamespy have started a series of features on San Andreas, theres no new info but is has a nice summary of the info so far, part 2 will be released tomorrow. Salvatore Leone to return in SA? It seems that Frank Vincent, voice actor for Salvatore Leone in GTA3 will be returning in SA according to his website. "...look forward to Frank lending his voice once again as Don Salvatore Leone in the sequel to Rock Star's Grand Theft Auto III." Salvatore was the don for the Mafia in GTA3 so could this mean the return of the Mafia in San Andreas? Maybe. Thanks to GTAGaming for the info. Well then I had a thought. Remember Terminator 2? It was made in 1991, so thats the early 1990's like San Andreas, its set in LA, like Los Santos in San Andreas. Now roughly 1 hour through the movie we see the T-1000 running after Arnie, John and Sarah in their car, he runs at unhuman-like speeds and catches up then lunges forward and morphs his arms into some metal things and holds on to the car. I will go and scan through T2 now and try to capture a screen of it for the benefit of those who havent seen it. You should remember the film anyway, I was only 8 when i first saw it and i remember it vividly. Rockstar Games kindly sent out all the big fansites 'gift packs' with some stickers and a San Andreas t-shirt in them. Most people who got sent this recieved them 4 days ago on June 1st. Chris: Just added these images to the Fanart page.